Paul (Hippolyte) Delaroche (1797–1856) was a lifelong resident of Paris, who trained under Baron Gros alongside fellow student Richard Parkes Bonington (1802-1828). One of Delaroche’s students was Jean-Léon Gérôme. Throughout his career, Delaroche painted portraits and depictions of major events in French and British history, together with a few religious scenes. In contrast to his contemporary Bonington, Delaroche’s paintings were invariably simple compositions showing full detail, and with a flat Salon finish. He never showed any tendency towards the painterly. With historical subjects, this gives them the appearance of great accuracy and authenticity, almost as if he had been present at the event. Delaroche also lived through a great deal of history himself: he first exhibited in the Salon in 1822, in the early years of the Bourbon Restoration after the downfall of Napoleon. In 1830 the July Revolution led to the July Monarchy, then the Revolution of 1848 brought the Second Republic. In the final years of his life, Delaroche saw the start of Napoleon III’s Second Empire, bringing France full circle. Jeanne d’Arc, or Joan of Arc, (c 1412-1431) was a peasant girl from Domrémy in north-east France who had visions instructing her to support the uncrowned Charles VII of France, in his struggle against occupying English forces. She gained fame when, only nine days after being sent to the siege of Orléans, that siege was lifted. Following this the French had a series of quick victories, and Charles’s coronation took place in Reims. She was captured by English allies on 23 May 1430, and handed over to the English, who had her interrogated, put on trial, and burned at the stake on 30 May 1431, at the age of about 19. Twenty-five years later she was declared innocent, and a martyr, and in 1803 Napoleon made her a national symbol of France. 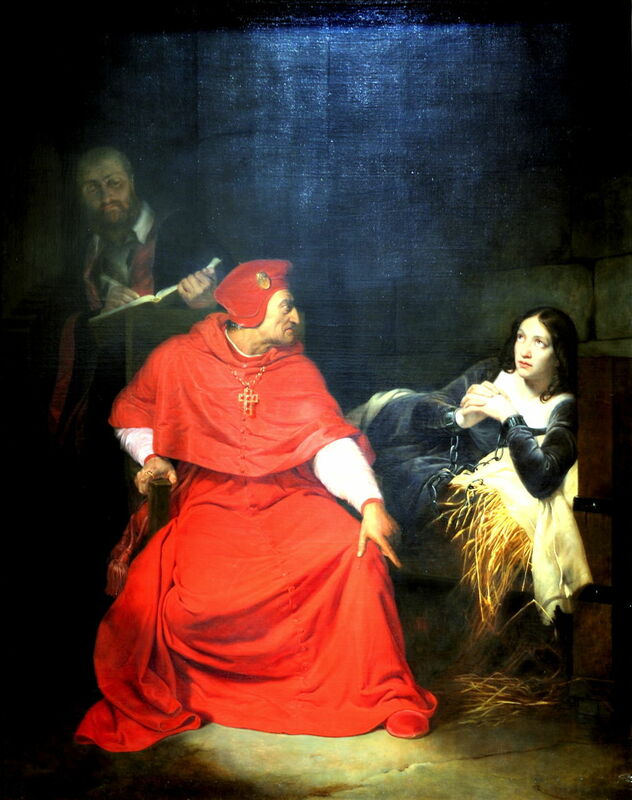 Delaroche puts the two central figures of the Cardinal of Winchester, as interrogator, and Joan of Arc, as prisoner, facing the viewer. But the Cardinal’s gaze is directed at Joan, and she looks dreamily up to heaven, her manacled hands clasped in prayer. A figure in the background gloom makes a written record of proceedings for the subsequent trial. Excellent use is made of facial expression and body language. After the downfall of Napoleon, there was a political crisis in Spain. King Ferdinand VII of Spain refused to adopt a liberal constitution, and in 1820 there was a rebellion against the monarchy. The King was held at Cádiz, and other European powers authorised France to intervene and restore the King’s rule. On 17 April 1823, the Duke of Angoulême led French forces through the Pyrenees into Spain. They reached Cádiz in August, and on 31 August 1823 launched a surprise attack on the fort of Trocadero there. Cádiz finally surrendered on 23 September, and the king was handed back. The battle of Trocadero was one of the events which triggered the US Monroe Doctrine, and the Duke of Angoulême was honoured as the ‘Prince of Trocadero’. 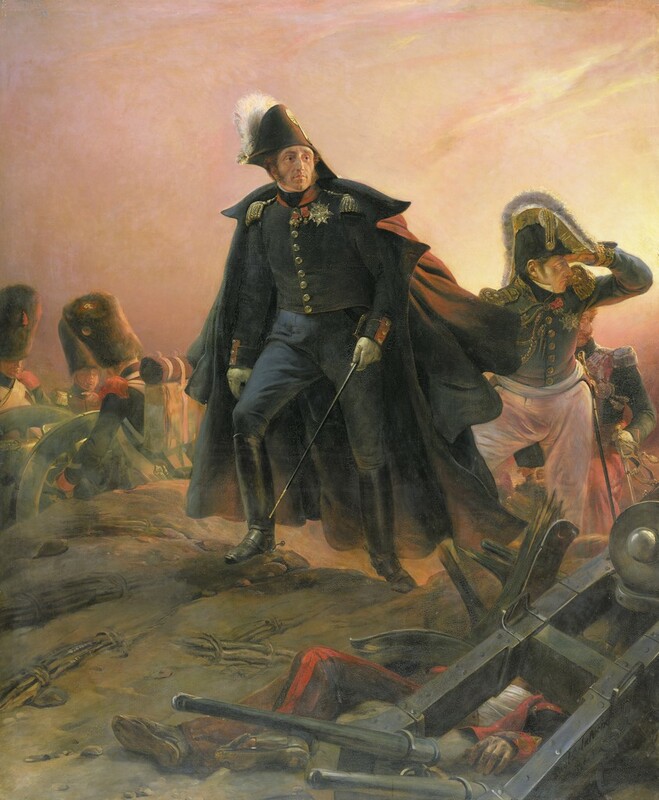 The Duke of Angoulême is shown in a dominating pose, his adjutant behind him, scanning the situation intently to the right. Around them are casualties from the intense battle, and a gun crew in the background. Although the painting says little about the story of the battle, it tells much about the leadership and outcome. Queen Elizabeth I of England and Ireland (but not Scotland) (1558-1603) was one of the most autocratic and successful British monarchs, and remained unmarried despite many rumours of relationships. She never named a successor, and being without any direct heir, there were fears of a power struggle when she died. The autumn of 1602 saw the deaths of several close friends, and she apparently was plunged into depression as a result; the onset of winter would not have helped. She fell sick in March 1603, and her depression deepened. She died between 0200 and 0300 on the morning of 24 March 1603 at Richmond Palace. Within hours, her successor was proclaimed as James I of England and Ireland, also James VI of Scotland. 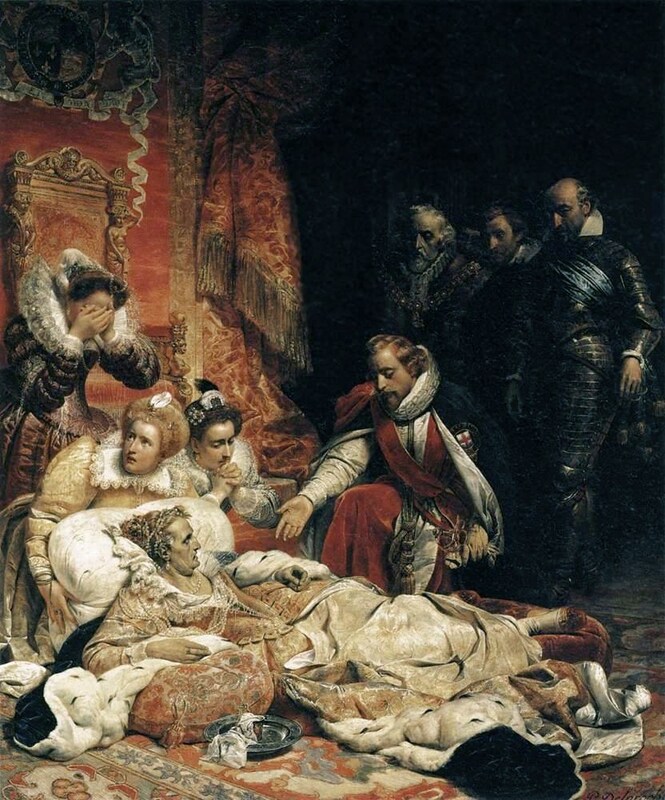 The haggard queen is shown slumped on a makeshift bed on the floor, which appears most implausible, but puts her low in the painting. Her maids and other female attendants are in distress – one even covering her face with her hands – behind her, supporting the pillows on which her head rests. I presume that the male kneeling by the queen and extending his right hand towards her is Robert Cecil, leader of the government at the time, and behind him are other members of the Privy Council of England, who were shortly to install Elizabeth’s successor. In addition to facial expressions and body language, Delaroche makes very good use of directions of gaze to inform us of the complex interactions taking place. King Edward IV of England had two sons: Edward, the older, was destined to succeed him as King Edward V, and his younger brother Richard of Shrewsbury, Duke of York. Edward V had the unusual distinction of being born in Westminster Abbey, where his mother had sought sanctuary. These were troubled times for the monarchy in England, and Edward IV’s death on 9 April 1483 only made matters worse. 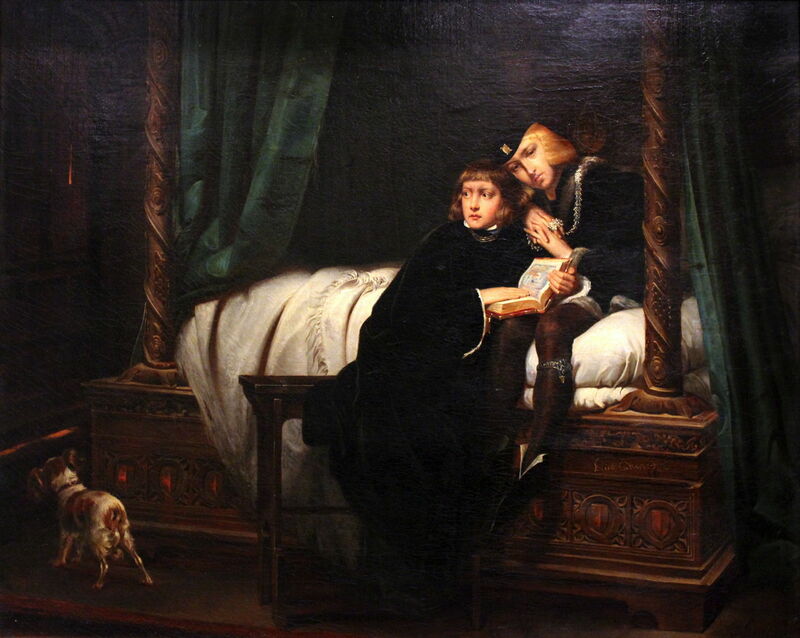 When Edward V succeeded his father to the throne, he was only 12, so was put under the care of his uncle, the Lord Protector, Richard, Duke of Gloucester, who aspired to be king himself. The plot started to take shape soon after the death of Edward IV, with the arrest and eventual execution of the young king’s companions. Then on 19 May 1483, King Edward V took up residence in the Tower of London, a month later being joined by his brother Richard. A move was made to declare Edward IV’s marriage retrospectively (and post mortem) invalid, making their sons illegitimate. The Lord Protector, Richard Duke of Gloucester, was therefore declared the legitimate king on 25 June, and he acceded to the throne as King Richard III the following day. The boys Edward and Richard were confined to inner parts of the Tower of London, and eventually disappeared altogether. Although there is still considerable uncertainty about what happened, it must be presumed that King Richard III had the boys murdered, probably by suffocation. In 1674, the bones of two children were discovered in the Tower, and King Charles II ordered that they be presumed to be those of ‘the Princes in the Tower’, and interred in Westminster Abbey. Delaroche uses another simple composition, supported well by facial expressions. The two boys are seen, huddled together on a bed. Edward is staring wistfully into the distance, his head cocked on one side, knowing too well the fate that awaits them both. His younger brother has an illustrated book open on Edward’s thigh, but is looking anxiously, his brow knitted, to the left, as if he can hear someone approaching and their fate drawing close. At the foot of the bed is a small dog, also looking into the dark beyond. England in 1553 was in turmoil. King Edward VI’s reign of six years was marred by economic problems, social unrest which erupted into open rebellion, and war with Scotland; these had culminated with the King’s death at the age of just 15. As he had no natural heirs, there was dispute over his succession; his plan for a cousin, Lady Jane Grey, to become Queen was put into action, starting her rule on 10 July 1553. When King Edward’s half sister Mary deposed her on 19 July, she was committed to the Tower of London, convicted of high treason in November, and executed on Tower Green by beheading on 12 February 1554 at the age of just 16 (or 17). Lady Jane Grey and the Lieutenant of the Tower, Sir John Bridges, take the centre of the canvas. She is blindfolded, the rest of her face almost expressionless. As she can no longer see, the Lieutenant is guiding her towards the executioner’s block, in front of her. Her arms are outstretched, hands with fingers spread in their quest for the block. Under the block, straw has been placed to take up her blood. At the right, the executioner stands high and coldly detached, his left hand holding the haft of the axe which he will shortly use to kill the young woman. Coils of rope hang from his waist, ready to tie his victim down if necessary. At the left, two of Lady Jane Grey’s attendants or family are resigned in their grief. Lady Jane Grey wears a silver-white gown which dominates the entire painting, forcing everything and everyone else back into sombre mid tones and darker. 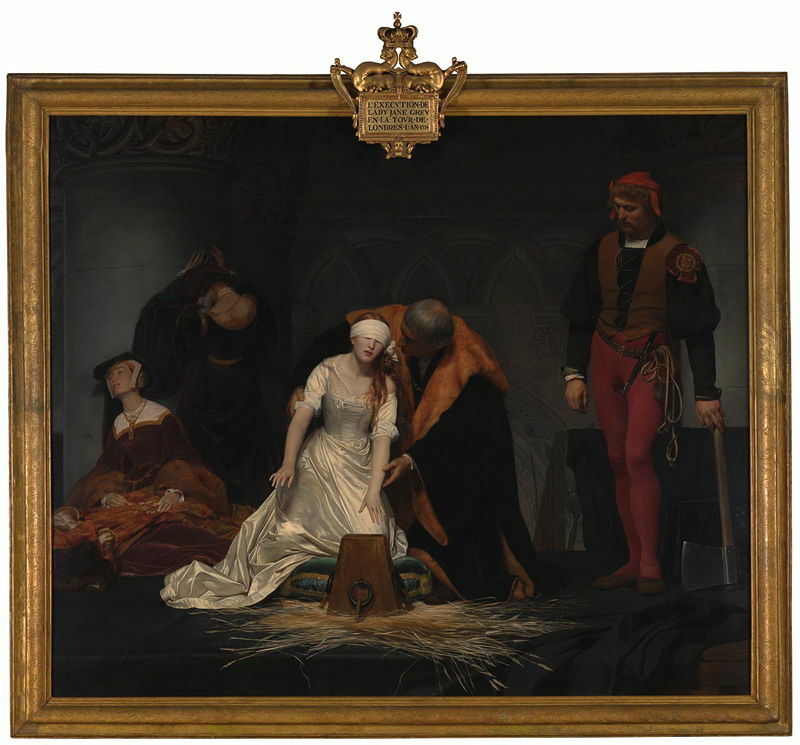 Delaroche might appear to have made an accurate depiction of the scene, but in fact he made one major alteration: Lady Jane Grey was actually executed in the small court-like space within the Tower known as Tower Green, not in a dark room. Although he has little scope to use facial expression, body language is very important, and there are numerous cues to the original narrative. Its simple composition and the radiance of Lady Jane Grey’s gown help charge the painting with atmosphere, and it caused a sensation when first exhibited at the Salon of 1834. The Duke of Guise, Henry I, Prince of Joinville and Count of Eu (1550-1588) was a key figure in the French Wars of Religion, as a strongly anti-Huguenot (anti-Protestant) leader, and founder of the Catholic League. The aim of the League was to keep the new heir, Henry of Navarre, a Huguenot, from succeeding Henry III. Guise made the Treaty of Joinville with Philip II of Spain to make Cardinal de Bourbon heir to the throne. As a result, Henry III sided with the Catholic League. When Guise organised an uprising in Picardy, Henry III became alarmed and ordered Guise to remain in Champagne. However, Guise ignored this and challenged royal authority by entering Paris. Henry III tried different tactics, and made Guise the Lieutenant-General of France. Still feeling threatened by him, the King sent for Guise when he was staying at the Château de Blois, and had him murdered by the King’s bodyguard as he watched. The following day, Guise’s brother, Louis II, Cardinal of Guise, was also murdered. These two assassinations resulted in such outrage among the Guise family that Henry III had to flee and take refuge with Henry of Navarre. Henry III himself was assassinated the following year by an agent of the Catholic League. Delaroche divides his canvas in two. 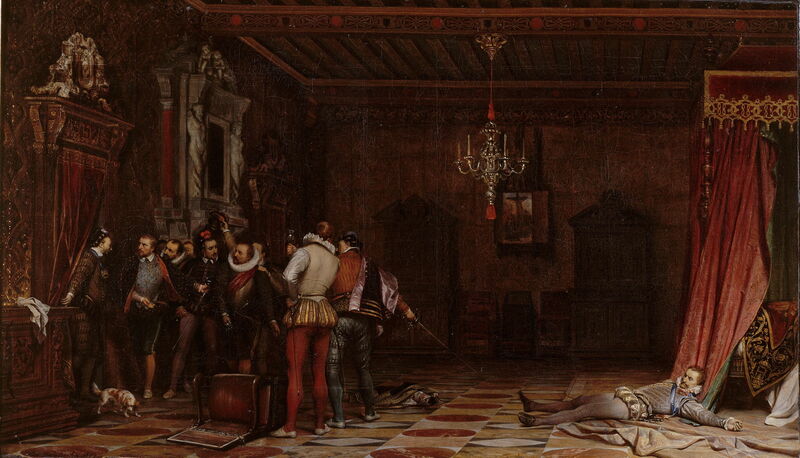 On the right, the Duke of Guise lies, dead, in a melodramatic posture with his arms outstretched, at the foot of a bed. At the left, a group of men are talking with one another, most clutching their swords, but none paying the slightest attention to Guise’s body, as if it was not there. Presumably that group includes Henry III and his bodyguard. There is no opportunity to use facial expression, and only body language and composition are needed to establish the story here. Napoleon seized power in France on 9 November 1799. In early 1800 he made military moves to reinforce French troops in Italy, so that they could repossess territory which had been lost to the Austrians in recent years. 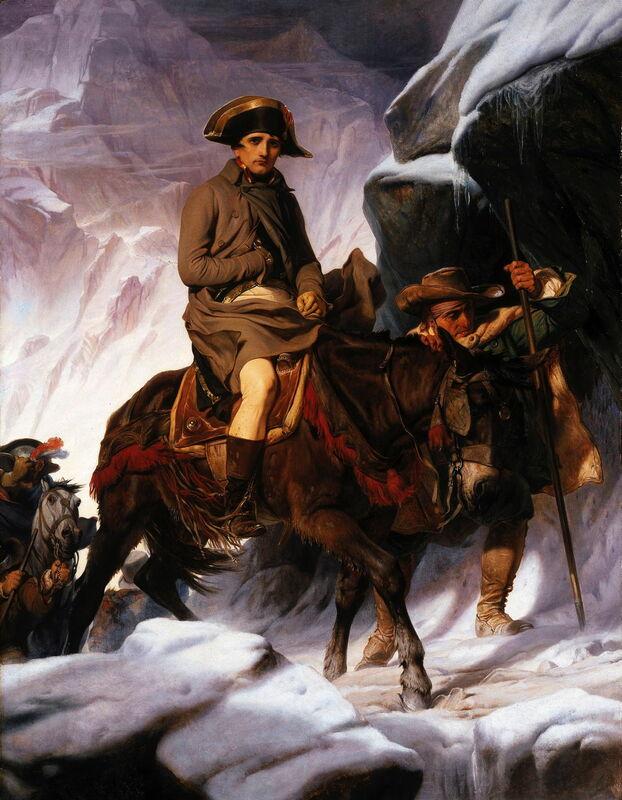 Napoleon, leading the Reserve Army, crossed the Alps via the Great St Bernard Pass in May, and fought their first battle at Montebello on 9 June. Jacques-Louis David was initially commissioned by the King of Spain to produce an equestrian portrait of Napoleon crossing the Alps. David painted a highly idealised image, which proved so popular that he made five copies between 1801 and 1805. David had previously been a figure of considerable importance in the French Revolution. When Arthur George, the third Earl of Onslow, visited the Louvre with Paul Delaroche in 1848, he commented on the impracticality and implausibility of the image painted by David. He therefore commissioned Delaroche to paint a more faithful version. Delaroche swaps the impressive but completely inappropriate rearing horse used by David, for a mule, the only beast capable of taking Napoleon over the pass in these conditions. This is not in the least demeaning, and does not detract from Napoleon’s image as a leader, of course. However, Delaroche is still a good way from the truth. Napoleon’s face is bare, his left hand uncovered and resting on the pommel of his saddle, and he is wearing a thin cloak and thin riding breeches. It remains a ‘photographic pose’, even if slightly closer to reality. This was commissioned in 1837 as a tribute to the greatest artists of history, an apotheosis if you will, to cover the walls of the semi-circular auditorium in the École des Beaux-Arts in Paris. 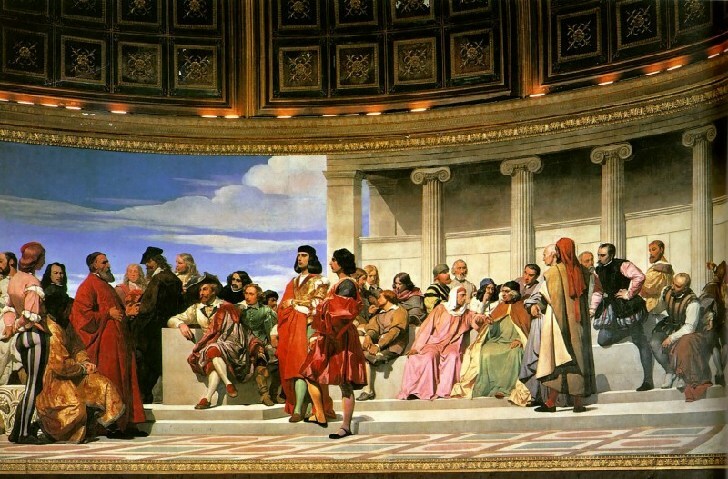 Modelled after Raphael’s School of Athens (1509-11), a famous fresco in the Apostolic Palace of the Vatican, Delaroche set out to include all the most important figures in the history of painting, drawing, sculpture, architecture, and print-making. Some of those he included now appear odd, and are almost unheard of, and there are some surprising omissions. However, Botticelli, El Greco, and Vermeer – who are absent – were not rediscovered until later in the 1800s. Being painted in oils and wax on a hemispherical wall, it is very hard to show the complete painting in situ. Delaroche’s student Charles Béranger (1816–1853) was commissioned to make a miniature copy onto canvas, which I show below. 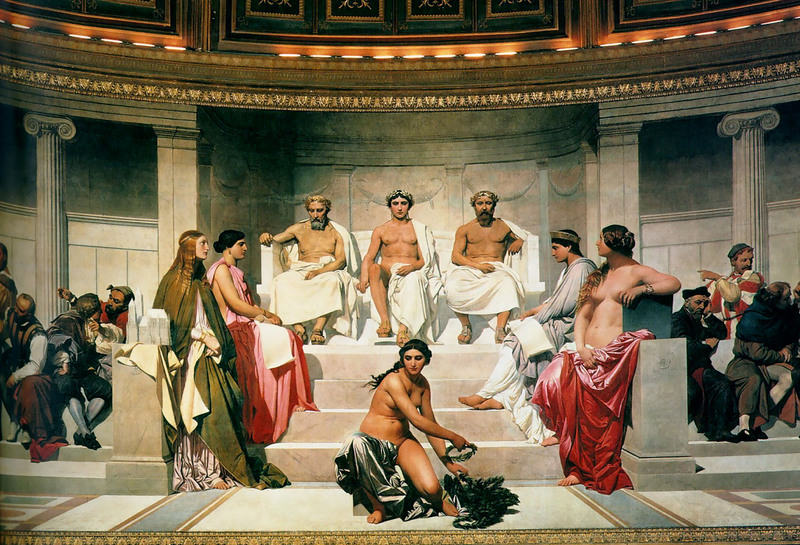 Charles Béranger (1816–1853) after Paul Delaroche (1797–1856), The Hemicycle of Fine Art (copy) (1841-53), oil on canvas, 41.6 x 257.3 cm, Walters Art Museum, Baltimore, MD. Wikimedia Commons. The three throned figures in the centre are Ictinus (architect), Apelles (painter), and Phidias (sculptor). Flanking them on the left are personifications of Greek and Gothic art (left), and Roman and Renaissance art (right). Below is the figure of Fame, who is distributing laurel wreaths to the winners of the Prix de Rome. The figure of Gothic art is said to be a portrait of Delaroche’s wife Louise, daughter of Horace Vernet. 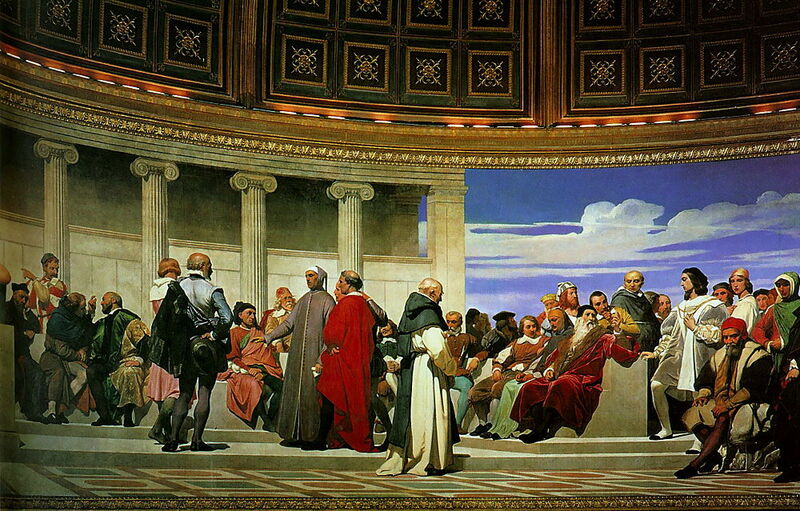 Paul Delaroche (1797–1856), The Hemicycle of Fine Art (detail) (1836-41, 1853), oil and wax on canvas, approx 4.5 x 27 metres, École nationale supérieure des Beaux-Arts, Paris. Wikimedia Commons. On the left are: [Corregio, not shown], Veronese, da Messina, Murillo, van Eyck, Titian, Terborch, Rembrandt, van der Helst, Rubens, Velazquez, van Dyck, Caravaggio, Bellini, Giorgione, Ruisdael, Paulus Potter, Claude Lorraine, and Gaspard Dughet (all painters); Vischer, Bontemps, della Robbia, da Majano, Pisano, Bandinelli, Donatello, Ghiberti, Palissy, Goujon, Cellini, Pilon, [Puget, and da Bologna, not shown] (all sculptors). On the right are: Delorme, Peruzzi, von Steinbach, Sansovino, Luzarches, Palladio, Brunelleschi, Inigo Jones, di Cambio, Lescot, Bramante, Mansart, and Vignola (all architects); Fra Angelico, Marcantonio, Edelinck, Holbein, Le Sueur, del Piombo, Orcagna, Dürer, Leonardo da Vinci, Domenichino, Fra Bartolommeo, Mantegna, Romano, Raphael, Perugino, Michelangelo, Masaccio, del Sarto, Cimabue, [Giotto and Poussin, not shown] (all painters and/or print-makers). All told this painting is about 4.5 metres high, and 27 metres long. Delaroche completed it in 1841, but in 1855 it was badly damaged by fire. He set about restoring it, but died before that could be completed; the task was finished by Joseph-Nicolas Robert-Fleury, then a professor at the École des Beaux-Arts. As an accomplished narrative painter, Delaroche was adept in the use of facial expression and body language, to which he added simple but highly effective composition and use of space, and directions of gaze. His history may seem grim, and focus on treachery, execution, and murder, rather than human achievements. However, the stories which he uses reveal much about our past, and offer clear guidance for our future. They are far less moralistic than many paintings of the nineteenth century, but uncomfortable reminders of our inhumanity in the past. No matter how authentic his depictions of history may appear, Delaroche’s decisions were ultimately determined by overall effect, and on several occasions he departed significantly from historical fact. But he gets away with it. Ruutz Rees J (1880) Vernet and Delaroche, Illustrated Biographies of the Great Artists, Scribner and Welford. No ISBN. Posted in General, Painting and tagged Bonington, Delaroche, Gérôme, Gros, narrative, painting. Bookmark the permalink.